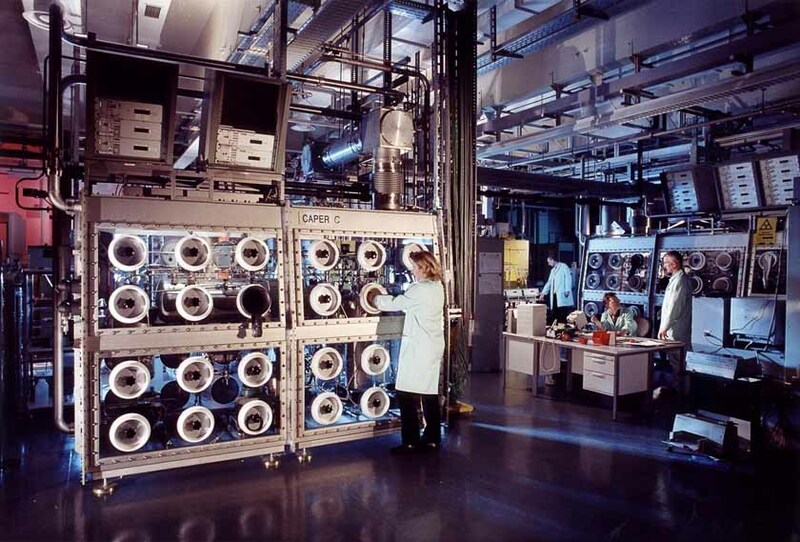 Fig.1: The Tritium Laboratory Karlsruhe provides the infrastructure for Tritium handling. Fig. 4: Cooling concept of the WGTS beam pipe. Fig. 6: Laser Raman Spectroscopy to measure isotopical gas composition. The measurement of the neutrino mass is a high precision measurement. This requires well defined and well controlled conditions for the creation of the beta-electrons, which are analyzed for their energy in the spectrometers to reveal the secret of the neutrino mass. The Windowless Gaseous Tritium Source (WGTS) provides a required highly stable flow of beta-electrons towards the spectrometer with a technical complex and challenging control and monitoring of the Tritium gas content and composition on the 10-3 level. In principle every radioactive beta emitting isotope could be used to look for the neutrino mass. Amongst them Tritium is a premium candidate for performing neutrino mass searches. The Karlsruhe Institute for Technology hosts with the Tritium Laboratory Karlsruhe (see fig.1) a semi-technical scale facility for processing tritium. With its license to handle up to 40 grams of tritium, its present site inventory of about 25 grams of tritium plus its extensive infrastructure and experimental apparatus TLK is the state of the art facility to perform the KATRIN experiment. The molecular Tritium gas must be on cryogenic temperatures around 30 K in order that corrections to the electrons energy due to the thermal movement of the decaying mother atoms, do not get too large. Once having set the beam tube to a temperature in the range between 27 and 33 K, this temperature must be kept stable on the mentioned permille level. 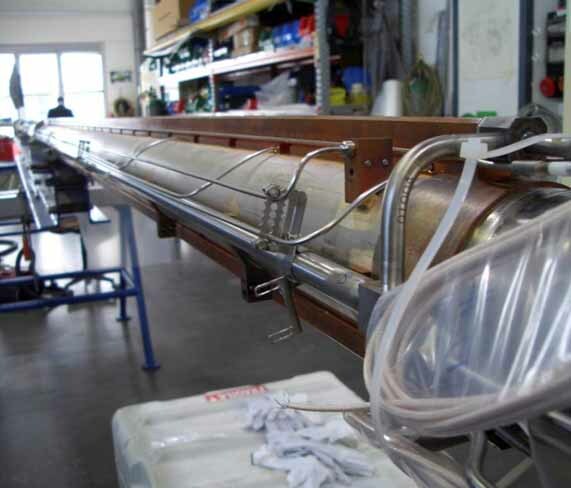 For such a large object like the 10 m long WGTS beam tube, a novel cooling concept had to be developed and tested (fig. 4) [1,2,3]. In 2011 the KATRIN collaboration was able to demonstrate with the novel cooling concept, which is based on a 2 phase liquid Neon thermosiphon, a stability as low as few mK fluctuations within hours, meeting by far the KATRIN requirements. The tests have been carried out with the so-called Demonstrator, which used the original main parts of the WGTS cryostat. As one can imagine the amount of tritium inside the source scales with the inlet pressure. It turns out that the inlet pressure must be stabilized on the same level as the temperature. This is achieved by using a large pressurized control vessel, from which the Tritium flows via a capillary to the beam tube. Already in 2009, the team working on the Tritium loop system was able to demonstrate with such a technique the required stability level for control and monitoring (fig. 5). KATRIN needs a high isotopic purity of molecular T2 gas (>95%). Beside T2 molecules, there are also fractions of DT and HT molecules in a gas mixture. Due to their different molecular masses and binding energies electrons from such decays have different endpoint energies. Therefore, it is crucial to keep the admixtures of such decays as small as possible. Furthermore, measuring in situ the isotopic content together with an activity measurement (see below "Monitor Detectors") allows monitoring directly the column density. With the so-called LARA system, there has been developed, commissioned and tested a ready to go Laser Raman spectroscopy system, which can measure every 200 seconds the isotopic contents of the WGTS with 0.1% precision (fig. 6) . Particles detector, detecting directly also the low energy beta electrons from the source, have been constructed or are under tests to monitor the activity (i.e. decay rate) of the WGTS. The Forward Beam Monitor Detector is a small pin diode being positioned close to the edge of the magnetic flux tube, which is transported to the Focal Plane Detector. It can handle high data rates, while keeping the 0.1% precision, which means it takes only seconds to measure the activity of the WGTS and thus to infer together with the isotopic composition from the LARA system the column density. In addition, a x-ray detector being positioned behind the rear plate of the WGTS, will detect the induced Bremsstrahlung when the electrons hit the plate - another method to measure sufficiently precise the source activity.